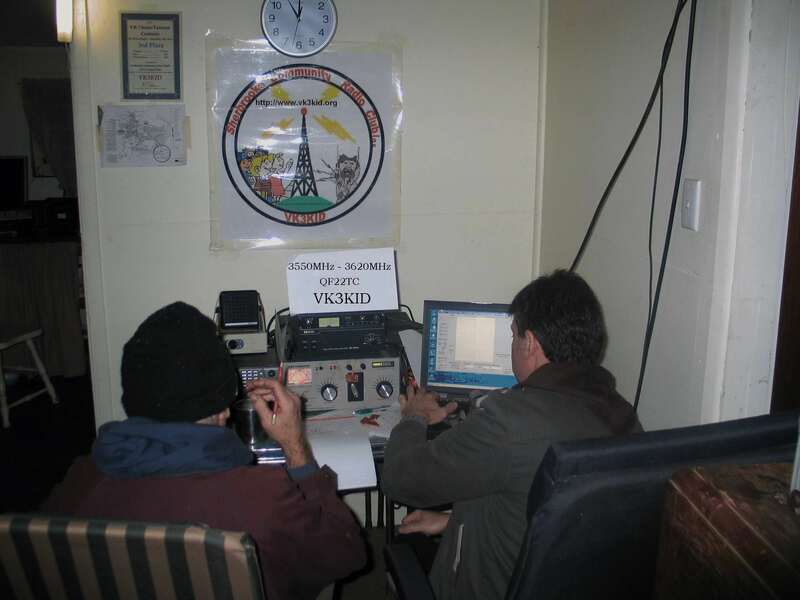 “80m Trans Tasman” 2012 | Sherbrooke Community Radio Club Inc. VK3KID - “Sherbrooke Community Radio Club are happy to help any new Amateur Radio operator into the hobby.” “Age is not a barrier, just drop us a line." Sherbrooke Community Radio Club Inc (VK3KID) Contests the“Trans Tasman” 2012 we came 5th. Members of the Sherbrooke Community Radio Club Inc, got off to an early, mid week start, during the second week of May, commencing preparations on the 10th by packing up voluminous quantities of radio equipment, plus half a ute load of wire antennas, a generator , one nine meter tall aluminum extension mast, and “Flickee”. Following much later, after the large ute load of operating equipment arrived on Friday morning, were four carloads of other various, far less important, mere life support items, such as food clothing and bedding. All this, for the purpose of undertaking their annual “Sacred Pilgrimage” event, The VK -ZL Trans Tasman Contest. 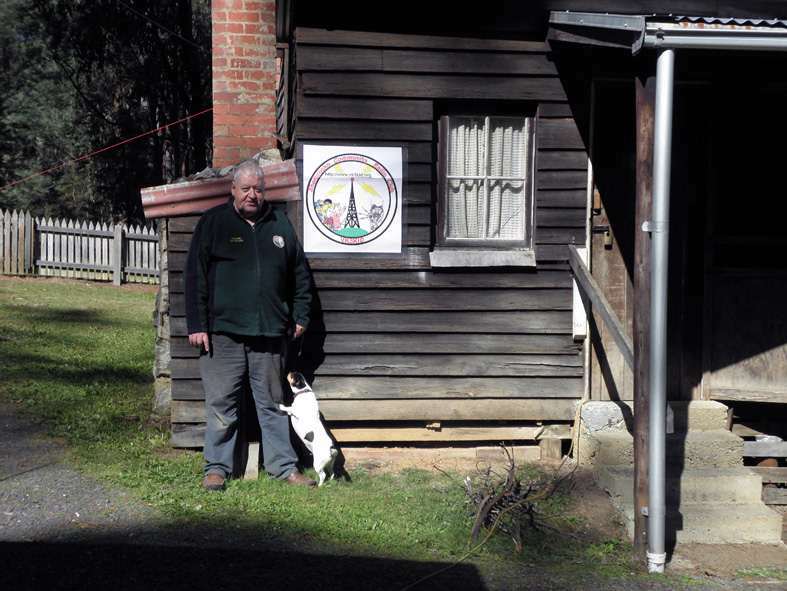 Members and visitors traveled to Kurth Kiln Regional Park, near Gembrook, for the assembly of a substantial, wire antenna farm and portable HF station at the historic, heritage listed, Kurth Kiln Charcoal making camp. Club president , Jim McNabb, (vk3amn) who shall now, henceforth and hereafter, be officially titled and addressed as “El Presedente” and new club member Michael (vk3cmv), commenced assembly of the wire antenna farm mid Friday morning, finishing just before sundown. 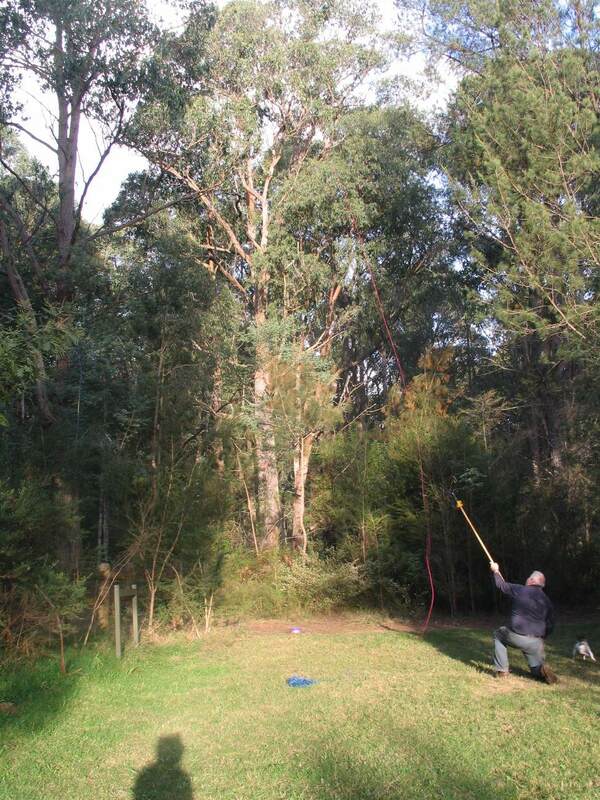 Three very substantial wire antennas were hauled skywards , courtesy of “Flickee” and six of the local 35 meter tall “Mountain Ash “ antenna supports. Number one antenna consisted of a full size folded dipole , fed by a 4:1 current balun into a resonant quarter wave 75 ohm transformer section and then another quarter wave of 52ohm coax into the main operators shack. This antenna was aligned by hand compass, broadside to ZL on a bearing of approximately 125 degrees. The second antenna erected, was a single element, square configuration, quad loop with the flat top mounted at approximately 20 meters above ground, fed directly at the center of the base, by a section of quarter wave of 75ohm coax into another quarter wave of 52ohm coax running back into the shack. Again, the hand compass was used to align the quad loop, on bearing 90 degrees, giving east/west coverage. A local communications link was also established, via a portable Echolink node, Vk3KID/L. 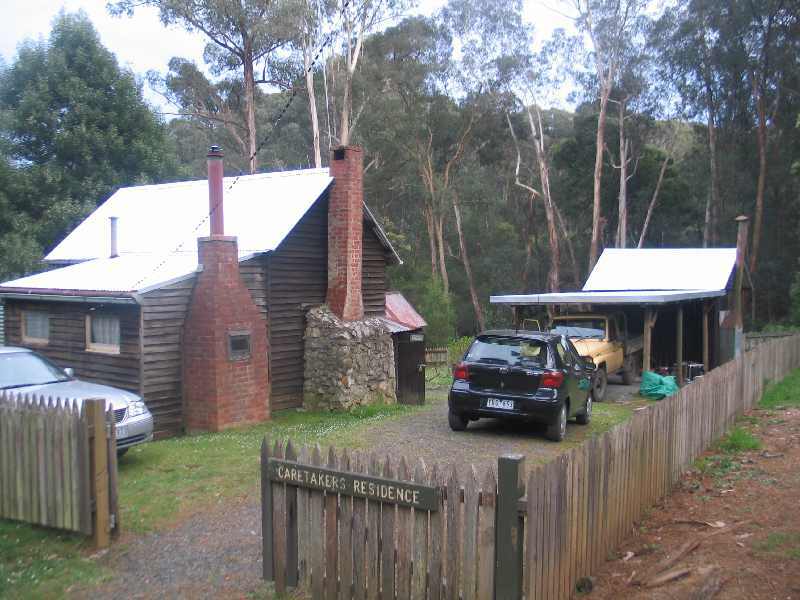 The main historic shack, became the “Operating Shack” with members preparing for camping overnight in several of the other smaller shacks also on the reserve. Club members then very successfully participated in the 8o phone section of the contest, logging over 240 contacts during the six hour contest period from 1800 -2400 EST on Saturday the 12th . Numerous contacts were made into all mainland Australian states, with excellent signal reports being received. 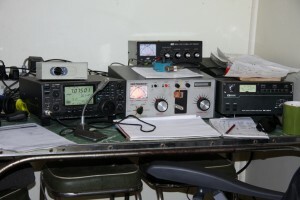 Considerable numbers of ZL contacts were also logged, with 4 New Zealand regions being worked. For Leo (vk3flmr) it was his very first foray into the battlefield of a phone contest and a real baptism of fire which he handled with great efficiency. Well done Leo. Most members elected to camp overnight in the historic timber huts, alternating between huddling around the glowing camp fire drum outside the main “Operators Headquarters” and the occasional trip inside to participate , observe the frantic activity at the microphone and the logging laptop, or simply to boil the kettle for a regular cuppa, and recharge with essential nourishment, in order to keep the very chilly evening conditions at bay. Sunday morning saw many bleary eyed faces emerge from the huts, to make breakfast and then gradually disassemble the station and wire antenna farm, in-between the persistent rain showers. Members departed late morning for their various homes all having enjoyed a great weekend. 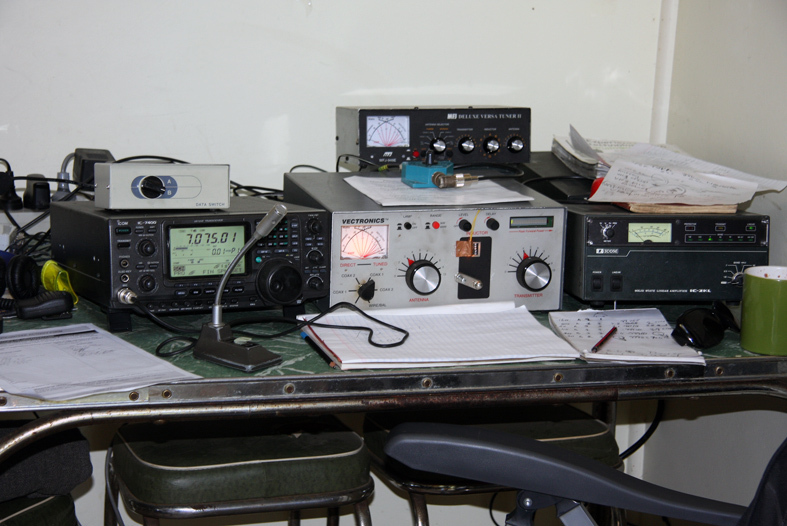 In 2012 , another very successful “Trans Tasman Contest” has entered the logbook of The Sherbrooke Community Radio Club, call sign Vk3KID. 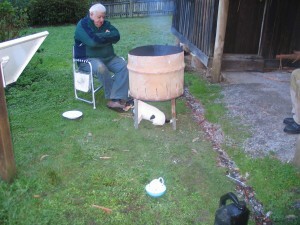 “I think VK3WOF-WOF was cold early on Sunday 11 June 2012 morning.